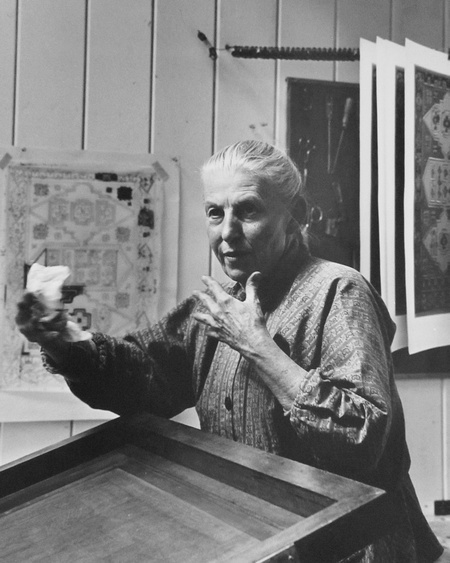 Dorr Bothwell, in her Mendocino studio, printing the serigraph God Bless You. Photo: Bill Foote (1965). The term SERIGRAPH (seri – silk, graph – to draw) was coined in the 1930s by Carl Zigrosser (Curator of Prints in the Philadelphia Museum of Fine Arts) in order to distinguish the Fine Art screen print from the commercial products of the silk screen industry. The first exhibition of serigraphs was shown in New York in 1939. At first Museums and Galleries questioned whether screen printing should be accepted as a bona fide fine art medium. But as more and more serious artists, attracted by the ease of using color, and the versatility of the method, became serigraphers, serigraphs were finally admitted to print exhibitions. 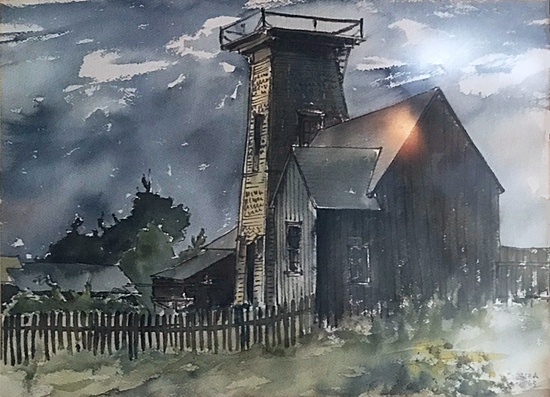 By the mid-fifties, serigraphy was finally considered a viable fine art printing method and at long last serigraphs were hung as equals alongside lithographs, etchings and woodblock prints. – Dorr Bothwell (1985), Tokaido Journey by William Zacha, page 61.